Friday’s session remained weaker-than-expected as the NIFTY opened low, drifted even lower and went on to end the day with a loss of 165 points or 1.59%. Despite the fact that the Markets saw large number of shorts piling up, the Index showed no inclination to recover. A very minor recovery was seen towards the end but it did no good to the overall closing of the Markets. We open the fresh week on Monday with a little precarious situation. We have been grossly underperforming the global markets on one hand. On the other, we have seen significant amount of shorts that have piled up in the system. As we approach Monday’s trade, there are two distinct possibilities. We might see a subdued opening and there are chances that the 200-DMA levels of 10161 may be tested and might see some intraday violation as well. Also, there are equally good amount of chances that Markets find support once again at 200-DMA and it is not violated at Close. We will see very strong supports coming in the 10040-10160 zones. Resistances can be faced near 10245 and 10310 zones on the upside. 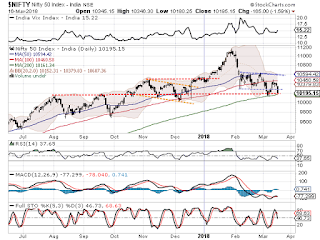 The Relative Strength Index – RSI on the Daily Chart is 37.6497 and it remains neutral showing no divergence against the price. Daily MACD continues to remain bullish while trading above its signal line. 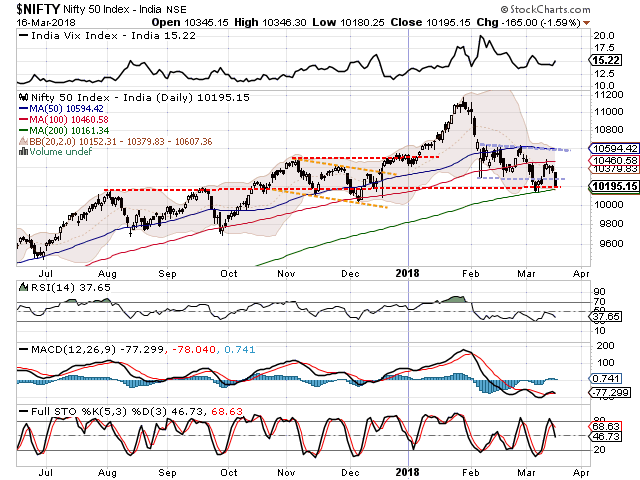 If we look at pattern analysis, the NIFTY currently stands near to a very strong support of 200-DMA on the Daily Charts. This level is followed by a strong pattern support at 10040. So, in a way, the zones of 10040-10160 pose a very serious and long term support for the Markets. Overall, though there is no denying to the fact that the zones of 10040-10160 provide for a strong support area. We also take into account the large number of shorts that have been added all through the previous week. However, until the NIFTY at least potentially marks this as a bottom, we need to continue to take a ultra-cautious view on the Markets. The reason is that in even of violation of these levels, we may see some more pain in the Markets over coming days. However, there is still no structural breach on the Charts and given the other piece of evidences; we can expect potential marking of bottoms near current levels. Shorts were seen being added in stocks like RCOM, ICICIBANK, TATA MOTORS, ITC, IFCI, STATE BANK, INFIBEAM, RELIANCE, SAIL, CGPOWER, BHEL, ENGINEERS INDIA and INDIGO.